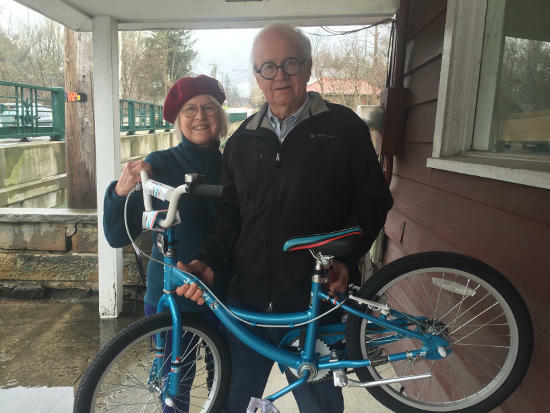 Century Cycles Blog: Congratulations to the latest WINNER from WKSU's Spring Fund Drive! Congratulations to the latest WINNER from WKSU's Spring Fund Drive! Meet Helen and Stanford from Streetsboro, Ohio! Helen was the winner in the latest prize drawing for the WKSU Spring Fund Drive. We had originally purchased a Momentum Street hybrid bike to provide to the prize winner. Due to health issues, Helen is no longer able to ride a bicycle, so we supplied a Raleigh Jazzi 20-inch kids bike that they will present to one of their grand-daughters! They picked it up from the Century Cycles store in Peninsula yesterday. WKSU is Northeast Ohio's regional National Public Radio station at 89.7FM in Kent, 90.7FM in Norwalk, 95.7FM in Ashland, 89.3FM in Wooster, 89.1FM in Thompson, and 91.5FM in New Philadelphia. Thank you to WKSU for helping us to promote bicycling, and thank you to ALL who donated as part of the Spring Fund Drive! New designs available from Nutcase Helmets!